Abu Dhabi: Residency departments across the country have adopted stricter visa rules, banning tourist, visit and conference visas for workers from certain labour exporting countries. A senior official told Gulf News the move is intended to better protect citizens and residents by preventing foreign criminals from coming to the UAE. He said: “The Federal Residency Department, which oversees residency departments across the country, has decided to adopt stricter regimes for tourist, visit and conference visas to curb the influx of blue-collar workers from many labour exporting countries into the country,” said the official who wished not to be named. 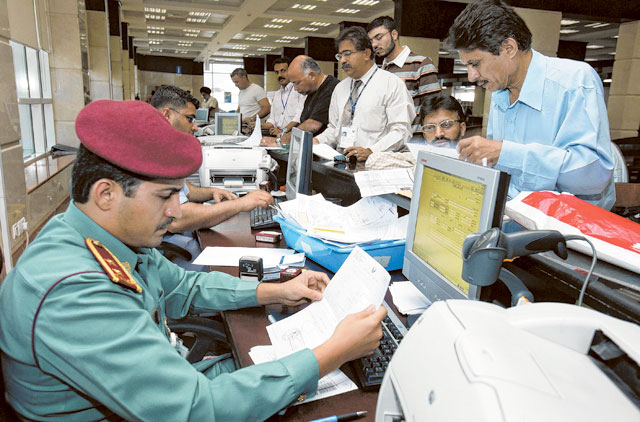 The new regime bans visit visas for some workers, especially from traditional labour exporting countries to the UAE, and sets a university degree as a prerequisite for obtaining a visa, plus other requirements, the official said. India, Pakistan, Bangladesh, Sri Lanka and The Philippines are some of the largest countries exporting labour to the UAE. Categories banned from obtaining tourist, visit or conference visas include electricians, pipe fitters, masons, farmers, drivers, tailors and cleaners. The requirements include round trip tickets, proofs of a confirmed hotel booking and and enough money to finance the stay. The move was prompted by the recent arrests of scores of foreigners on tourist, visit and conference visas, who were either engaged in organised crimes, human trafficking or were found unemployed and looking for jobs or begging in the streets, or near hospitals, mosques and malls, according to the source. The source stressed the UAE continues to welcome genuine visitors. “However, these visa requirements will give authorities a greater ability to manage the flow of visitors into the country and allow residency departments across the country to screen more travellers for security risks prior to their arrival in the UAE. The UAE last reviewed its visa requirements for other countries in 2008. The source stressed it is up to applicants to satisfy visa officers that their visit to the UAE is temporary and that they would not overstay, that they have enough money to cover their stay, have health insurance and are not a security risk to citizens and residents. Tourist visas must be prearranged, usually through a hotel but possibly also through an airline or other travel agents based in the UAE. Hotels, travel agents, airlines and other companies, which arrange a tourist visa for a customer, are also held responsible for their customers and pay deposits to cover any fines. Concerning conference visas offered to business people wishing to attend an event or fair, they will have to submit proof of their status as a businessman or woman or investor and have enough money to cover their stay and health insurance. Welcoming the new regime, some tour operators said they arrange tourist visas for visitors only through their relatives living in the country, who pay charges of up to Dh10,000 as a surety that the visitors will comply with the visa rules. Others would withhold passports of visitors during their stay in the country, they said. They warned of companies who submit fake information about visitors especially for subjects of countries whose passports do not include recognised professions.